The East Resort boasts the longest trails in the region serviced by a single high-speed quad. 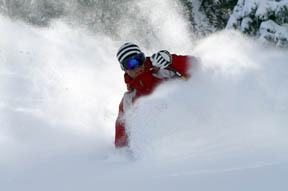 It is known for its deep powder, gladed tree skiing areas and breathtaking views of the Mojave Desert. Rising as high as 8,200 feet, the East Resort offers traditional skiers and snowboarders a true alpine experience without having to travel far from home. 1,600 vertical feet of uninterrupted corduroy makes it one of the best carving mountains in Southern California and it also serves up exciting steeps like the Olympic Bowl, Southern California’s longest, steepest bump run. After a quick ascent on the Mountain High Express, you'll find an additional 20 acres of beginner terrain all serviced by its own quad chairlift. This often overlooked area is perfect for learning and designed to stimulate the heart as well as the head. For new skiers and snowboarders, there are uncrowded beginner trails at the top and bottom, and lessons are taught here every weekend peak season. When you are done, relax at the Grand View Bistro, Mountain High's gourmet mountain-top restaurant, and enjoy a delicious meal at 8,200 feet. Nestled at the top of the East Resort, the Grand View Bistro offers an Italian-themed menu and an alluring view. Come enjoy the sit-down atmosphere, daily specials, and assorted beers. Located at the base of the East Resort, this restaurant features made-to-order breakfast burritos built to tackle The Beast. In addition, you'll find a tasty lunch menu that's sure to satisfy any appetite. Looking for a fresh, hot grilled lunch? Try our fantastic burgers, chicken sandwiches, BBQ pulled pork, and 1/4 pound brats. Located on the East sundeck. Visit this cozy nook in the Angeles Crest Cafe for a Hot Toddie or a tall cold-one and catch the score of your favorite team. Lessons for ages 4 and up are offered at 10am and 1pm on peak weekends and holidays. Lessons are offered first come, first serve, and can not be reserved in advance so get here early in order to make your lesson on time. We recommend arriving by 8am if you wish to make the 10am lesson. This gives you enough time to get through tickets and rentals, and be at the Winter Sports School meeting area 15 minutes in advance. Our Rossignol Experience Center filled with top-of-the-line equipment tuned to the highest standards. Why hassle renting somewhere else when everything you need is right here. Remember, pay at the ticket windows first then pick up your equipment in the Rental Shop, located in the same building as the ticket windows. Visit the Ride Shop next to the ticket windows for everything you need to enjoy your day on the mountain. Need a full tune-up or just a small part to get you back on the mountain? Our repair shop offers everything from quick fixes to complete overhauls. You'll find the Repair Shop located just inside the Rentals "return" entrance. Please do not under any circumstances leave your skis or snowboard unattended. Use the FREE Corral located just off the East deck. 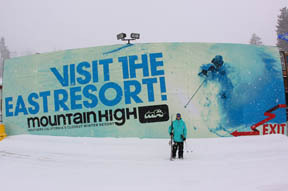 Free shuttles run continuously between the East and West Resorts, 7 days-a-week when open. For anything from directions to Lost & Found please visit our Guest Services booth located to the left of the main ticket windows.